Grant Dixon recently reviewed PFK Spectra in the "Fishing News". The Article is reprinted below for those who may have missed it. There is no doubt gel-spun polyethylene lines (commonly called superbraid) have come a long way since they were first introduced. Now the first New Zealand made product is available on the market. The basic fibre used is "Spectra" from American manufacturer Honeywell, and this is imported in its raw state to be spun locally into superbraid. Auckland-based retailer Paul's Fishing Kites has been associated with a range of innovative New Zealand made products, and this is just another of them. PFK Spectra is currently available in seven line weights - 30, 50, 80, 130, 160, 220 and 330 pounds - and two spool sizes - 500 and 1000 metres. I first tested the 80lb PFK Spectra in Fiji using a Penn 9500SS Spinfisher top-shotted with 300 metres for casting poppers, and a Penn International 30TW with 700 metres for deepwater livebaiting and trolling. Braided line is ideal for casting poppers. 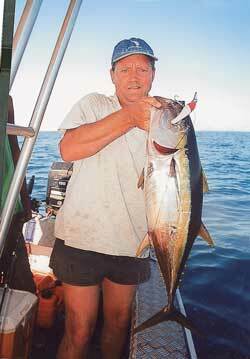 Its fine diameter allows the angler to fish a heavy enough line class to deal with the likes of giant trevally and dogtooth tuna in their rugged backyards. It gives the angler plenty of stopping power to keep the fish away from sharp coral ledges and bommies, while still being quite manageable casting wise. Several good fish were taken on the PFK Spectra line, including yellowfin and walu (spanish mackerel). In the latter instance, I did experience some problems with the line wrapping around the stripping guide during the casting process - resulting in a couple of spectacular distances with the lure no longer attached to my rod and reel. However, PFK Spectra is available in two configurations - the plain white one I was using, and a second, less supple version with a thin thread of dacron woven into it to give a little memory. On my return, I obtained some of the "speckled" Spectra and did some trial casting with it without any hitches - literally! The Spectra spooled onto the Penn International 30TW was used extensively for trolling over the five-day Fishing Safaris" trip based out of Ellington Wharf, Raki Raki, and no problems were experienced. It holds its knot strength well (especially when tied with a doubled strand) and is ideal for trolling deep-diving bibbed minnows, as the thin line diameter has much less resistance and allows the lure to reach deeper running depths. Several good fish were taken on the PFK Spectra line, including yellowfin and walu (spanish mackerel). While weather and missed opportunities have not allowed me to test the PFK Spectra on the likes of bass and hapuku, I have no doubt its little or no stretch qualities will stand me in good stead for these deepwater species in the near future. The line is also great for all kite fishing rigs due to its low stretch factor and high breaking strain. Even when wound on tightly to beach or boat reels, the line will not explode spools, as can happen with the more elastic monofilament lines. There is also much less water resistance when retrieving, making it an easier task. A word of warning for all Spectra users. Because of the line's fine diameter in relation to the heavy breaking strain, it can be dangerous to use if not handled properly. Protective gloves are recommended and care should be taken when retrieving kites lines in particular. *PS : Sam Mossman has been doing some research into knots for braid and braid lines. You will be pleased to know PFK Spectra 37kg had a breaking point of 55kgs! 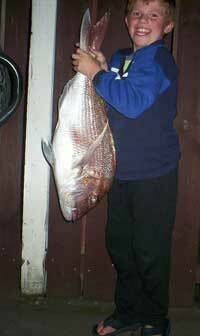 Photo : A catch of snapper, gurnard and kahawai taken by my son Jamie during May at Uretiti Beach on the East Coast. Alan Place and I went kitefishing on the west coast last month. When we arrived on the beach the winds were pretty light so we launched the Delta Force and set the out the gear. Within an hour however the winds got up. The kite gained altitude lifting the longline clear of the water until the pull became too much and the safety trace on the kite broke. After retrieving the gear we reset the longline with the Super Kite and it went out without any problems. The smaller kite handled the conditions well. It was hard fishing on the day with high surf, strong rips and driving rain. We still managed to catch 1 snapper, 6 kahawai and 3 gurnard. The fishing here is just starting to fire. Late June I did one morning set and caught three good snapper of 1.8kg, 3.1kg and a 6.2kg. During this particular fishing trip I caught a glimpse in the back swell of one very large snapper which unfortunately got off before I could land it. Upon closer inspection of the gear I found the hook had bent. I have had hooks bend before, particularly when fishing from the ledge, but this is the first one bent straight off the beach, it must have been a huge fish. Another local kite fisherman, Jeff Allan, caught several gurnard, a couple of sharks and seven snapper all around three kilograms each. Starting late July and running through to August and September the big snapper are relatively easy to catch here at Mokau so hopefully the winds will be favourable. It was great to see a new kitefisher, who I have helped set up with your gear, catch a really good one. On a recent fishing trip with dad we caught this 18 pound snapper off Takatu Point. The fish we caught ranged from 18 pounds down to 4 pounds, we caught a total of 15 fish from only one set. We were fishing with our torpedo which me and dad built, thanks to uncle Jim for the aluminium we now have a cool fishing unit that catches some good fish. Also thanks to Rob at the kite shop for helping us with the extra line and joiners and eyelets, he knows all the tricks. Scott with the biggest snapper taken on the home made fishing torpedo. Sunday was too nice to miss. When I got across the harbour from Weymouth to Ropa's Gutter there was hardly a ripple. I set a 25 hook longline across the gut in two meters of water as the tide receeded. Working back from the top end I pulled the dingy along the line replacing baits and removing fish. The fish followed me up and down the line eating the thrown-away old baits and the fresh ones on hooks. At times I could feel 2 or more fish in each direction. I had to stop after a short while as I had my limit of 10 gurnard and 10 kahawai. It was that calm, I cruised back to Weymouth standing in the middle of the dingy with the extention pole on the outboard like Lord Nelson at the tiller. Sunday 6 June saw over 100 hearty souls take to Porangahau Beach with their surfcasting rods, kites and kontiki"s, endeavouring to catch the biggest kahawai or gurnard. We were very pleased with the good turnout for a mid winter competition. However, the weather on the day was not what we would have liked and I"m sure it kept a lot of people away. For those who did brave the wintery conditions, they were well rewarded, not only with the odd fish or two, but with the quality prizes on offer. The field was made up of people who travelled from far and wide. Toby and Sasha Leiher won the "furtherest travelled" prize of $100.00 - sponsored by Bo and Annie McLean from the Duke of Edinburgh Hotel. Photo Above : James Frings caught this school shark on a super kite powered kite rig on his last set of the day. 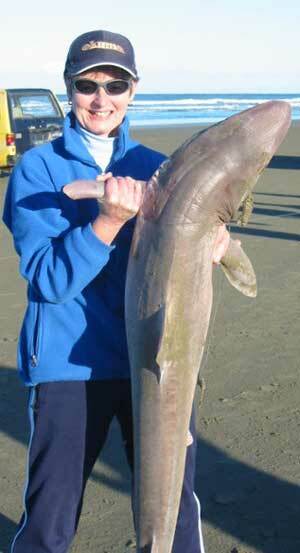 Sue Kemsley shown holding the fish. NZ Fishing News sponsored two spot prizes of six-month subscriptions to their magazine. These were awarded to Brett Hawke (Dannevirke) and David Svenson (Waipukarau) for the heaviest trevally at 1.9kg and 1.78kg respectively. DB Breweries also sponsored this event by donating Tui products as spot prizes for each section. Gary Kemsley (Area Manager for CD Rods - another sponsor of the competition) and his wife Sue (Napier) spent the day on the beach weighing in the competitors catches. Gary said it was very pleasing to see the number of young people out fishing at such a great beach and competing for the quality prizes the on offer. Watch out in the local papers over the coming months. 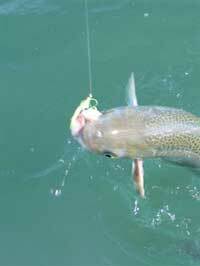 The next fishing competition is likely to be held over Labour Weekend - when the weather is hopefully a little warmer! Instead of putting knots in one side to make it shorter, I put a extension on the side I want the kite to fly to. I use electrical cable ties on the Mega Air 3 inflatable, they have a tensile strength of 22 Kg. I leave a tie permanently on each keel ready for when I need to tack. The one on the center keel is only half as long as the ones on the outer keels. Black cable ties are best as they are U V protected. Around 60 mm extension is the limit, remember to make the middle one only half what the outside ones are. Can you tell me what kind of fish this is. It was caught in South Padre Island Texas, but no one knows what it is. 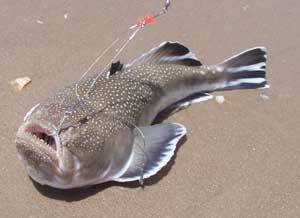 ED : It is a monk fish, and is also known as a stargazer. These fish are closely related to angler fish.They bury themselves so only the eyes protrude from the sand and await an unwary small fish to pass close by. They then open their upturned mouth so quickly that the fish is sucked in completely. In New Zealand we have two common species the spotted stargazer which lives in shallow water and grows to around two pounds and the giant stargazer which grows to around 20 lbs and is a uniform green colour. I used to catch a lot of the giant stargazers in set nets around 10 miles north of the Mokohinau Islands in water 130 metres deep when I was commercial fishing. They usually only take live or moving baits. After recalling a long conversation with you some time ago now regarding your research into the effectiveness of your Target Snapper Hook we recently decided to try some. We have used the old long line hooks for many years on our kite rigs and purchased the hooks specifically for fishing in the gulf for snapper and as a result of having respect for the protection of our fishery. Well you could not have produced a better suited hook. We fished with 2 others who, like us, at times caught some undersized fish. The big difference was that all ours using your Target Snapper Hooks were, without exception lip hooked and returned unharmed to the sea, whereas all the other undersized fish caught on the boat that day (caught on conventional hooks) had to have the line cut and were all returned to the water with the hooks still in their gut. I for one can not speak highly enough of your new hooks. Carry on the good work. I have been using your Target Snapper Hooks and they are excellent. All the small ones go back alive and well!! Are these hooks also suitable when fishing for things like gurnard ? 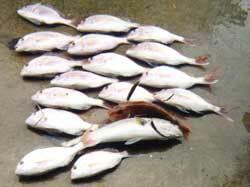 Ed : They work on most fish species except John Dory which swallow them and everything else they eat whole. 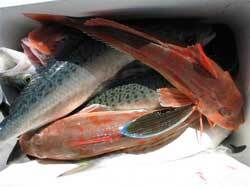 They are really good for gurnard which can often swallow all other hook types. A friend of mine recently purchased an inflatable kite and I am looking forward to replacing my Power Chute with one when the time arrives. A suggestion, he was going across to the east coast and thought that an extra set of bladders could be useful. Nothing was immediately available in the area so we cut some stays from some 1500 x 70 Aqua Stix, the flexible polystyrene foam round rods used in swimming pools for flotation. The Warehouse and K-Mart sell them. They worked like a charm. They are a bit stiffer than the bladders and only slightly heavier so didn't fold over in strong wind as much as the air bladders. We also use them to float our whitebait nets, they are ideal. The polystrene rods are very strong but still flexible. The ones from the Warehouse have a hole down the centre which makes them easy to split. Split each one into three sections and they will fit nicely in the kite. Regarding tacking, I have found that a drogue as supplied with the pocket sleds, clipped on to the harness where it attaches to the kite, on the side you want the kite to go, works fine without unbalancing the kite. Ed : One kitefisherman successfully fished an inflatable after replacing a punctured bladder on one side of the kite with a dry flax stem he found in the sand dunes. He said it flew perfectly! Hi all, sorry I have no photos for this report but we went out on Friday 9th July on 90 mile beach. We did two sets with 20 hooks on each. On the first set we caught 10 gurnard and 2 kahawai and the second set 7 gurnard and 3 snapper it was a great day on the beach with summer like weather.